In recent years in Korea, provision of social overhead capital such as port facilities, international airline aviation facilities, expressways, and rapid-transit railways has been expanding rapidly. As one of such outcomes, a rise in the hub function of Korea in Asia attracts attention. Moreover, since 2008, an action towards the Green New Deal policy aiming to promote economic and environmental countermeasures is spreading out among various nations. In January 2009, Korea also announced the policy, emphasizing job creation. Over four years until 2012, a plan is in progress to create new employments for about 960 thousand people by investing 50 trillion won to the provision of infrastructure having excellent energy efficiency including the Green Traffic Network as well as to various environmental projects. This issue picks up The Korea Transport Institute (KOTI), which plays a main role in research about transport policy widely in Korea. We focus in particular on Center for Advanced Transportation Operation Research of Dept. of Highway and Traffic Safety, specializing in the research on highways. The center performs a wide variety of research including leading-edge road systems and safety techniques of highways. When they developed a road safety evaluation system as one part of the research, they also planned to visualize its output. However, partly because it was hard to realize visualization, that part in the plan was once omitted. Under these circumstances, when they saw FORUM8 products exhibited at a conference on drive simulators (DS) held in Korea in 2008, they paid their attention to its possibility. In the autumn of 2009, they introduced 3D real-time VR software "UC-win/Road" of FORUM8. Since then, they applied UC-win/Road in 4 projects so far; in addition, they say they are utilizing it for several other projects. We interviewed Dr. Lee Dongmin, Associate Research Fellow and Mr. You Jungho, Research Assistant, Center for Advanced Transportation Operation Research of KOTI, both of whom have been mainly involved with the work ranging from the decision of adopting UC-win/Road to its use in multiple projects. KOTI is one of the formal research institutions of the Korean government. It conducts comprehensive studies on transportation and logistics. Its missions include offering advice and alternatives for the national transport policy and creating an optimum transport system through professional research and technological innovation. At the same time, equipping with world-class research capabilities and technologies to embody these missions, it has a vision of leading into an affluent future where humans harmonize with the environment and transport. The start of KOTI's activities dates back in November 1985 when KOTI was established as a foundation performing transportation development research according to Korean Civil Code Article 32. Then in August 1987, KOTI started as an institution funded by the government in conformity with the Urban Transport Promotion Act, Article 24. In January 1999, KOTI formally participated in the Korean Council of Economics and Social Research Institutes, and in March of the same year, set up its base in the Construction & Transport Research Complex in Goyang-si, Gyeonggi-do. The outcome of the action of KOTI over more than 20 years has contributed to an improvement of safety, convenience, and efficiency of transport in Korea. On the other hand, today, when the global trends require working towards low-carbon emission, KOTI is also committed to innovation of the research with this kind of challenge in mind. It is planning to expand towards a new transport paradigm. Currently KOTI has a staff of about 250 including approximately 80 doctors. It is roughly divided into nine categories including national transport strategy, logistics, metropolitan and urban transport, highway, railroad, air transport, advanced transportation technology, KTDB (Korea Transport Database), and transport infrastructure investment. In each of them they are advancing creative and leading research. Further, In aiming at the most suitable solution to the transport in the future in Korea, KOTI cooperates with the domestic and foreign main research facilities including some in Japan not to mention national and local governments. It lays emphasis on information exchange and personal exchanges through events such as conferences or symposiums, and projects or programs. The results of research are sent out widely by various publications as well. KOTI conducts about 200 research projects as a whole in a year. In recent years they say eco-related themes including CO2 reduction tends to be prominent in particular. Center for Advanced Transportation Operation Research of Dept. of Highway and Traffic Safety in KOTI is specialized in highways and studies advanced transport systems, safety technologies and so on. 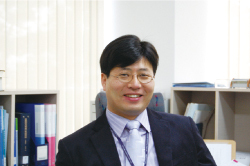 Dr. Lee Dongmin lists up the characteristic approaches in the Center; that is, setup of research themes that link information and communication technology (ICT) with transport, and positive utilization of ICT through the research process. Examples of these include research and development of ubiquitous traffic environment and "Smart Highway". The latter is an expressway concept of the next generation, which is studied in Korea in relations with the former. Recently, on the other hand, interest has been rising in how to utilize a smart phone by connecting it to the intelligent transport systems (ITS). Last year, Dr. Lee Dongmin and others performed some studies on an ecological road, which is another key word. In these studies, they performed research on "2 + 1 Roads" as a road of a new concept, research on validity to examine what is the most appropriate road for the needs of constructing new roads, and development of a road safety evaluation system. As mentioned in the beginning, it was the development of this road safety evaluation system that led Dr. Lee Dongmin to utilizing UC-win/Road. In this system, when designing a road, its safety is checked. If it is judged as dangerous, the solution is derived as to what to do in order to make it safe. In the autumn of 2006, they started a development project. They created algorithms of predicting potential accidents from the structural standards or accident history of roads, and systemized them. At the beginning it was planned to visualize the computed result so that anyone could understand it easily. However, following the fact that the duration of the project was shortened on the way, that part was put off. However, when they participated in the international conference of DS held in Korea in 2008, they experienced our exhibited products for the first time and realized their possibility. Later, having been supported by our staff, they introduced UC-win/Road in the winter of 2009. This has been leading to realizing the function to visualize the output of the system. First, they applied UC-win/Road to "Research on improving transit systems in Inland areas in Chuncheon" project, for which difficulties had been experienced in presenting its validity at the local briefing on constructing an "expressway" corresponding to the high-standard highway in Japan. He looks back and says that it was more effective in explanation than the previous approach. Next, "2+1 road" basically comprises one lane for each side, i.e. 2 lanes for both sides. In addition, one more lane is increased at here and there for passing. Just like a highway with 1.5 lanes in Japan, it is based on an idea of aiming at efficient road improvement as much as possible. Since it was a totally new attempt, its driving image was represented in VR for publicity matters of "Development of design standard of the 2+1 road" project. Besides, as a part of the intersection improvement of the expressway project, they examined a plan of establishing Sorae IC, creating VR to serve as the material for the briefing for residents. Successively, creation of the VR data for the Masan-si highway project is also in progress. Road data of "2 + 1 Roads"
The result of traffic simulation of "2 + 1 Roads"
"It is superior in that the time required to visualize highways, which was very long, has drastically been shortened and that it makes it possible to create VR with ease." Since UC-win/Road was introduced, it was used in the four projects mentioned above successfully. There is a growing awareness among the concerned parties of its effectiveness. Thus, Dr. Lee Dongmin says that he is going to apply UC-win/Road to the publicity of the round about, which is not so familiar to the public in Korea, and also to the briefing of "Research on traffic system improvement in Tongyeong - Geoje areas" project in the future. On the other hand, he expects that UC-win/Road will reflect Korean specifications more and enhance the settings for traffic flow. Moreover, to build up a concept of the new highway for the purpose of reducing carbon emissions, Dr. Lee Dongmin and others had finished its basic research and are planning to materialize it. He mentions a new development in saying that he would like to use UC-win/Road effectively in the research area related with highway policies including the above activity.